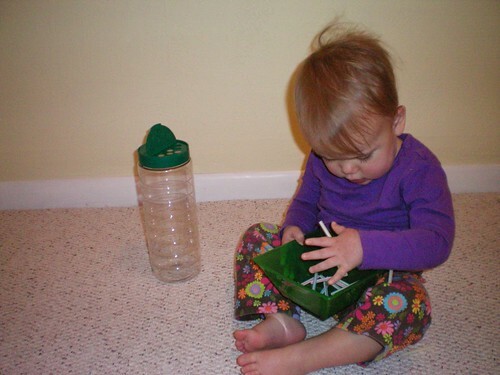 Previous article: Activities with Marbles and Golf Tees from Montessori at Home! Toddler programs in Montessori schools generally start at 15-18 months and run to age 2½ or 3. 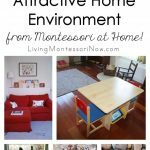 You can use many of the same Montessori principles and ideas to create a Montessori-friendly toddler environment at home. The Montessori phrase “Help me to do it by myself” is probably the most important concept to keep in mind for your toddler. Create an environment that will help your toddler gain as much independence as possible. There are many things you can do to make your home a Montessori-friendly toddler environment. 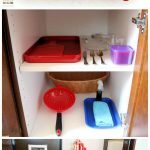 You’ll want to have low shelves with activities in baskets and on trays, toddler-size table and chair, and real child-size tools and utensils. Practical life activities for care of self, care of the environment, control of movement, and grace and courtesy will be essential. 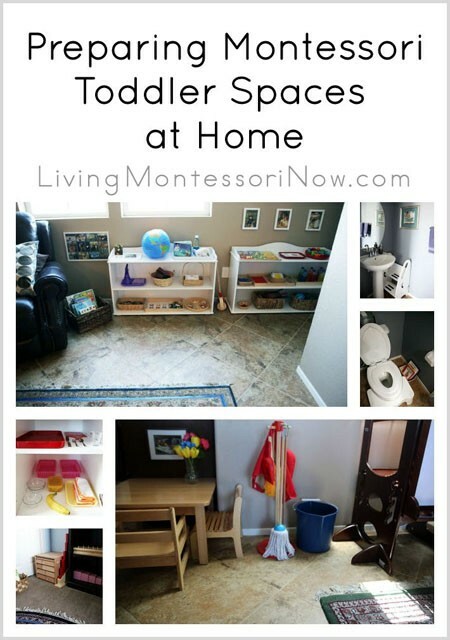 I have a number of posts about toddlers, such as Preparing a Montessori Baby-Toddler Space at Home. 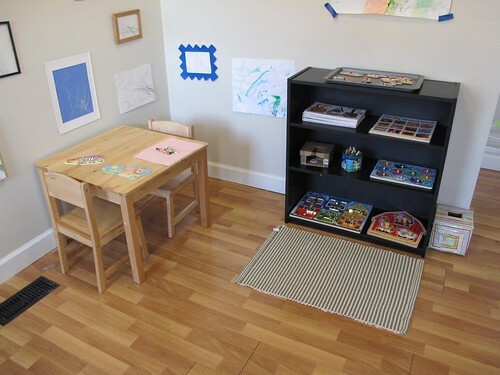 You can see my updated toddler environment in Preparing Montessori Toddler Spaces at Home. Montessori for Everyone has Essentials of a Toddler Classroom and other infant and toddler posts. The International Montessori Index has resources for Montessori Birth to Three. 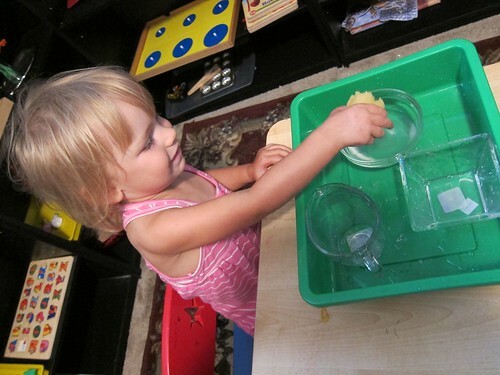 Daily Montessori has information for Montessori 12-24 Months and Montessori 24-36 Months. My toddler category has lots of activities for toddlers ages 1 to 3. I have a post on Top 10 Montessori Principles for Natural Learning. 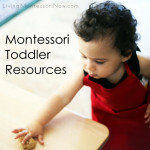 Montessori for Infants and Toddlers has blog posts with lots of Montessori ideas. 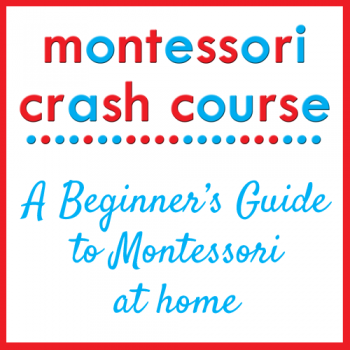 Montessori Mom has Toddler Scope and Sequence & Lesson Ideas – Practical Life Skills. “What’s unique about a Montessori program for toddlers?” is a 1-minute video from Cottage Montessori. It’s best to provide lots of manipulatives for learning, but don’t worry about doing many formal Montessori lessons with your child. Follow your child’s interests and let him or her choose activities. Here’s a reassuring post from Confessions of a Montessori Mom Blog: Can You Give a Toddler a Lesson? Also, check out A Montessori Infant and Toddler Home Environment at Confessions of a Montessori Mom Bog. Montessori MOMents has a post on ages 0-6 with some information and links appropriate for toddlers. 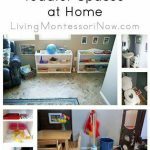 For older toddlers, see the links in my posts How to Set Up a Montessori Space at Home and How to Set Up a Montessori Homeschool Classroom. 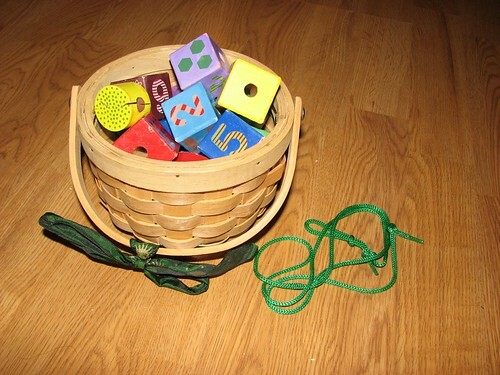 Montessori Mom has a post on Toddler Scope and Sequence & Lesson Ideas-Practical Life Skills. 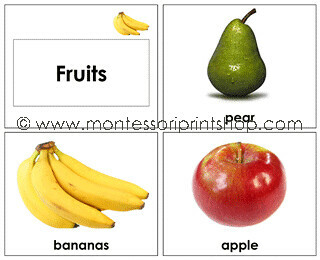 Montessori Print Shop has inexpensive toddler materials (materials for language development). Montessori for Everyone has inexpensive toddler materials (materials for language development along with a comprehensive checklist). Our Montessori Home has many posts on infant and toddler activities. 1+1+1=1 has Tot School ideas and links to other parents who often use Montessori-inspired activity trays and manipulatives. Little Red Farm has lots of Montessori-inspired toddler activities. Barefoot in Suburbia has lots of toddler posts (photo from Toddler Tuesday). 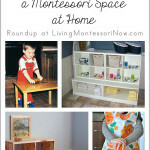 Montessori Mama has many posts with toddler activities. The Adventures of Bear has a Montessori-friendly toddler environment and lots of activities for toddlers. Kingdom of the Pink Princesses tells how they’ve adapted their home and homeschool to include a toddler. Jada Roo Can Do has many toddler activity trays (photo: Thrift Store Finds). My Child-Centered Life has many Montessori-inspired toddler activities. May be linked to Afterschool Express, Thoughtful Spot, The Mommy Club Resources and Solutions, Mom’s Library, A Little Bird Told Me Linky Party, The Weekly Kid’s Co-op, Homeschool Link-up, TGIF Linky Party, Preschool Corner, Ultimate Homeschool Pinterest Party, Sharing Saturday, Share It Saturday, Link & Learn. Previous Post: « Activities with Marbles and Golf Tees from Montessori at Home! I love all your ideas for the home environment. Little A has a montessori style room and has since she was 4 months old. In fact, she has never had a crib. We are working on making sure she has a place for her things in every room. Thanks for the extra info! How do you potty train a 4 year old with a disability? Hi Deb! Your blog is one of my starting places for Montessori inspiration. I wanted to add Four Little Thiiiings to the resource list for prepared learning environments. It is a blog devoted entirely to them! PS – Thanks again for the anniversary giveaway. Thank you so much for your wonderful website! I can’t get over the amazing amount of valuable information that you provide. Would you happen to have any tips on how to divide my time between my nine month old girl and 2.5 year-old son the Montessori way? While my girl is very content to play and discover on her own for long periods of time, my son has difficulty doing so. Often, when I spend time discovering an activity with my daughter, my son will try to take over or do some other deconstructive activity, like through objects. Thanks in advance! 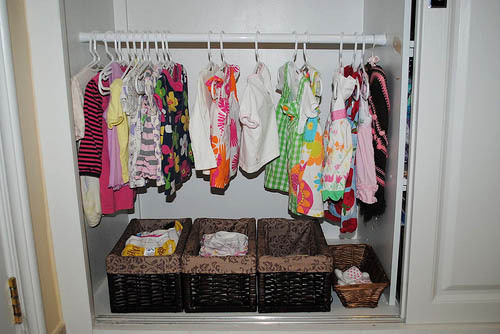 Should there be one toddler room or two toddler rooms in a school? Some Montessori teachers are saying the children should be split up into one younger and one older classroom. But I thought the Montessori method was to allow the older children to model the work for the younger children…. I am new to Montessori so thank you for your ideas! What do you think of the Kitchen Helper stools? Gosh they are expensive but I love The idea of my twins being involved in the kitchen. I just hate to spend that much money on something he would only use for a short time. Thoughts? Hello – I just found your blog and never heard of this “Montessori” before. I have a 7 month old and a 22 month old (both girls). I would LOVE to introduce this concept to my older girl, I really like the idea of the bed on the floor.. that way I wont go batty thinking she will climb out! Thanks for all this info, I am just getting started.